I eat a lot . I really really do eat really really a lot . I am addicted to crunchy food . Addicted as in i start munching , continue munching , and I don't stop until there is nothing left for me to munch . I need to evict these fat from where they are living now.I plan to exercise . Run . Burn those evil fat cells . And in order to push me and force myself to exercise . I participated in 2 upcoming runs . Both in October . 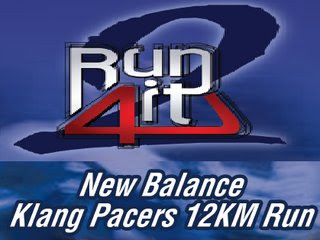 The first run is the New Balance Klang Pacers 12 km run which is held on the 12th of October . 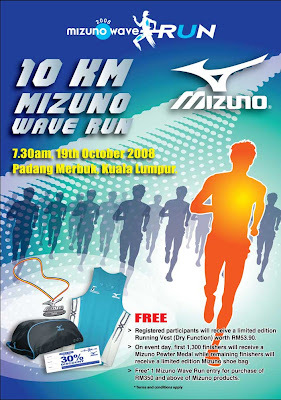 The second is The Mizuno Wave run on the 19th of October . Each , 1 week away from another . I had to pay a total of RM 65 . ( ya, OUCH ! ) But , I want the vest !! The goodies !! And ... to get rid of my unwanted fat . I've started my so-called training which involves running constantly for at least 10 rounds of a ring which is approximately 300 meters , and increasing 1 round day by day . Its really a good work out . Pumps your heart . Makes you sweat like you are in hell. I thought i would be burning a lot of fat just running like that . To my dismay , I gain even more . Instead of eating less , i realize , i eat more . My mind kinda tells me : " Aiya , its ok la . eat whatever you like now , after all , you'll be running later . " I have lots of mooncakes at home . Keropok . Biscuits . Mister potato . And my mum's desserts . I can't stand the sight of food left unfinished . For example : If the tub of Mister potato is half way to being empty , I would feel the need to finish all of it till its empty . And if there is 1/2 of a mooncake left in the fridge . I would stuff it into my mouth so that its totally out of sight . Is this some kind of eating disorder ? I think , if there was a total opposite eating disorder of anorexia ... this would be it .